Today’s victory concluded an incredible performance by the team from Auckland, New Zealand, which over two years won four of five Louis Vuitton Trophy events and finished second in the other. The finish gun today signaled the end of 20 years of competition in the America’s Cup, Louis Vuitton Cup and Louis Vuitton Trophy for the International America’s Cup Class. 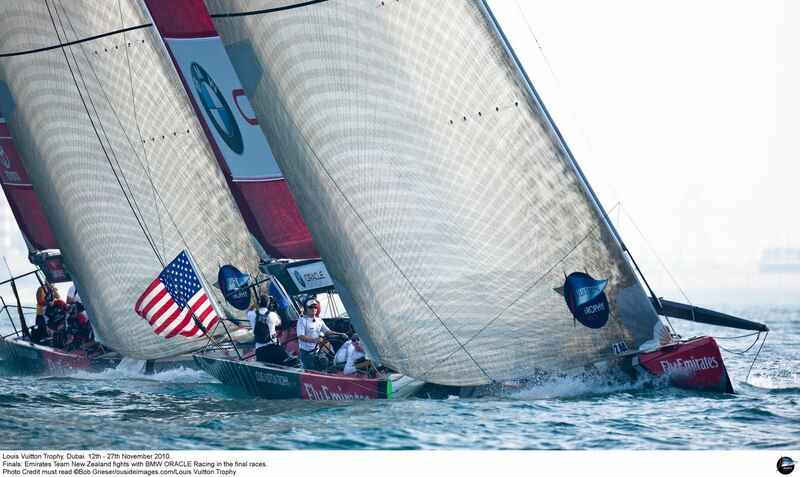 Introduced 20 years ago, the boats competed in five America’s Cup events. Serenaded by boat horns and sirens the Kiwi crew were hugging, cheering and hi-fiving for a minute and a half before the American boat finished. “It’s been a tough couple of weeks,” said Grant Dalton, the managing director of Emirates Team New Zealand who also races on the boat, his normally serious face split by a huge smile. 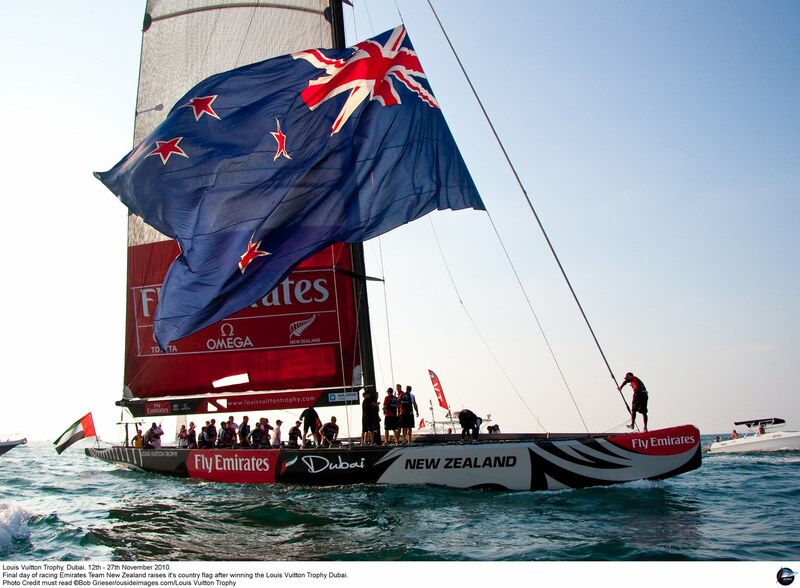 New Zealand’s Dean Barker landed the opening punch in his race with James Spithill. Just over two minutes before the start, with both boats almost stalled in a dialup, Barker turned sharply away. The Kiwi boat’s stern struck the side of the BMWOR boat. Spithill was penalized for failing to keep clear. The American boat went up the right side of the course, shutting out New Zealand attacks until the weather mark where Barker turned inside and drew almost level. The Kiwis kept the pressure on all the way down the run but made a slow mark rounding with their spinnaker momentarily in the water. On the beat, New Zealand went out to the port layline while the Americans worked the shifts up the middle of the course. With a 150 metre lead, Spithill unwound his penalty but left the door open for Barker to again get inside at the top mark and claim the right side of the course on the run to the finish. The Americans had it won until the Kiwis gybed into a shift and more pressure to overtake and win. The Kiwis claimed the pin end of the start and had a small lead up most of the course but Oracle enjoyed the benefit of the right side and overtook to lead by 11 seconds at the top mark. However, they lost ground when their spinnaker was stuck in the hatch for vital seconds during the hoist. Barker was able to get right on the run and stalked the Americans, helped further when they had to shed a ripped spinnaker in a gybe peel. With better pressure on the right, Barker kept closing on the run and crossed clear ahead on port tack just before the leeward mark. New Zealand covered their opponent and worked the shifts for the next two legs to finish 350 meters in front. 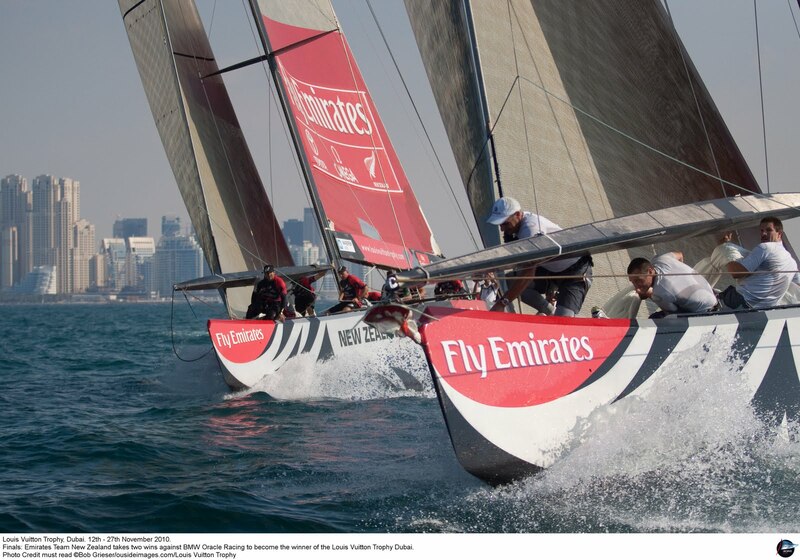 Their victory confirmed Emirates Team New Zealand as the winners of the Louis Vuitton Trophy Dubai.